Bold dinosaur bone ring with black diamonds by Mark Hileman. This handmade ring features black onyx and dinosaur bone inlay accented by black diamonds. 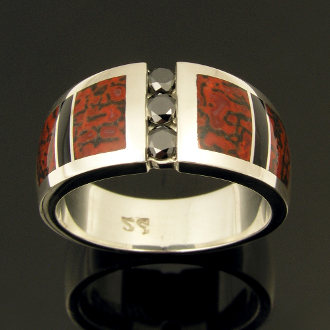 The ring is inlaid with 4 pieces of striking red celled dinosaur bone with black matrix. Two narrow sections of black onyx divide up the red dinosaur bone and bring out the black matrix in the gem bone. The 3 black diamonds are channel set down the center of the ring and total .30 carats. The ring is 9.5mm wide at the widest span where the diamonds are and tapers down to 5.5mm at the bottom. This dinosaur bone ring will be made to order in your exact ring size, just select your size from the drop down size menu. Special orders usually take 3 to 5 weeks to ship. The dino ring is hand signed "MMH" by Mark Hileman on the inside of the ring and stamped sterling silver.